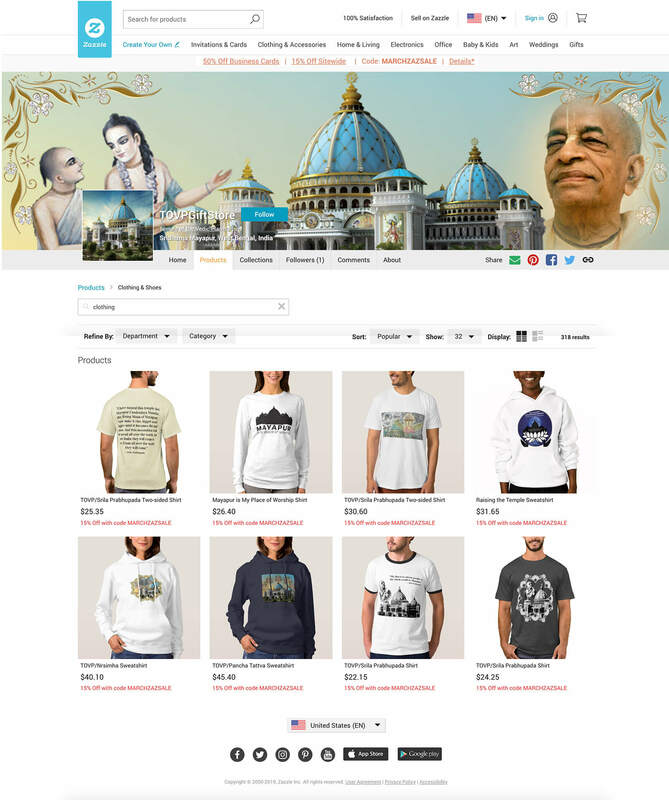 The Temple of the Vedic Planetarium management is very pleased to announce the Grand Opening of our long-awaited online gift store on Gaura Purnima 2019 as an offering to the Lord on His divine appearance day. With over 1000 popular items for sale, this online, on-demand International store will bring further awareness, dedication and funds to the TOVP. Through the Zazzle.com website platform the TOVP Gift Store will provide devotees with beautiful memorabilia that they can gift to others or use themselves as reminders of this wonderful project. It includes popular products like shirts, jackets, hats, buttons, watches, clocks, jewelry, keychains, posters, canvas art, notebooks, keepsake boxes, and many more items with artwork depicting the TOVP and its logos, inspiring quotes, and other designs related to the project. Products ordered from the store can be shipped from Zazzle.com’s 15+ worldwide locations to any part of the world as gifts, for personal use, as prizes for book distribution leaders, or many other uses. The ‘store’ has no stock. Each item is created ‘on-demand’ and shipped accordingly as ordered. MISSION 22 MARATHON KI JAYA!!! THINK 22 > TOVP NOW!